It still doesn't feel like it should be time to talk holiday bits, but it is. Holiday season is upon us and limited edition gifty bits are popping up. While I don't get too Christmas-y until the onset of December, now is a great time to start your shopping. Mary Kay has a few new sets that are perfect for gifting and are so cute, you can almost get away without wrapping them. Want a peek? Read on! Up first is a very cute twosome... The Cream & Sugar Body Gift Set combines a chocolate scented body scrub and a marshmallow scented body lotion. The scents of both are really nice, sweet, but delicate and not cloying. The scrub has the perfect level of abrasiveness (right in the middle) while the lotion has a creamy texture that is a bit weightier than a typical lotion, but not greasy and absorbs easily. The duo combines cream (the lotion) and sugar (the scrub) in a matchy geometric print box that is sure to please any giftee. Your second option is another cute one, but a little lighter on the wallet... The Body Lotion & Lip Balm Gift Sets combine just that- body lotion and lip balm- in decorated boxes that match the product packaging. 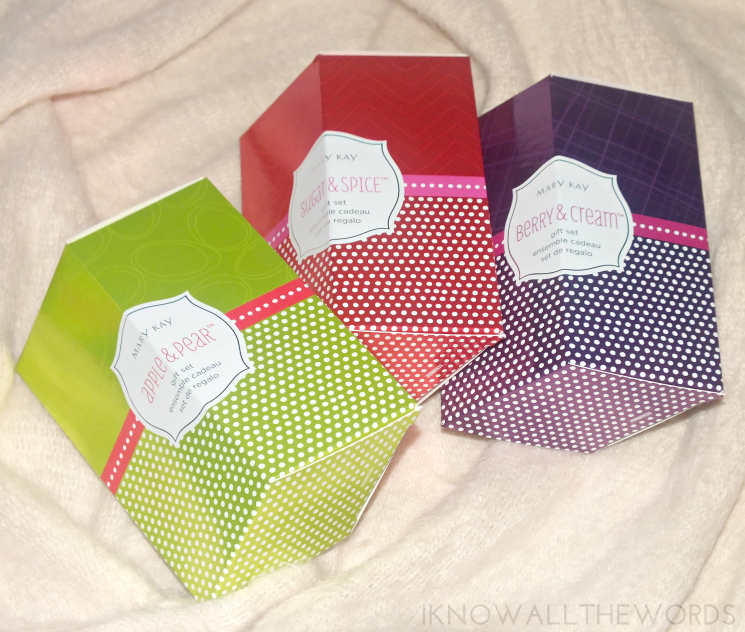 Available in three scents Sugar & Spice (red), Apple & Pear (green), and Berry & Cream (purple) these sets make for easy little gits (hostess, gift exchange, teachers, etc...) The scents all have a touch of sweetness, but again, aren't too sweet but are a nice addition to the product. The body lotion has a great texture that absorbs well and is actually quite hydrating. The lip balm has a Vaseline-type texture that protects lips and isn't tacky or greasy feeling. Overall, these are some great options if you're in need of some quick (and cute) gifts. What do you think? Would you gift these? Have you started your holiday shopping yet?